Found 3 file extension associations related to Star Wars: Empire at War and 3 file formats developed specifically for use with Star Wars: Empire at War. LucasArts and its most popular license from a galaxy far, far away explore the real-time strategy genre for a third time with Star Wars: Empire at War. Set a few years before the events in Episode IV, the game distinguishes itself by letting players take command of the Rebel Alliance or Galactic Empire throughout the entire galaxy, offering a wider assortment of strategic possibilities. Instead of concentrating on one particular region, players must also consider the ramifications of their actions on other planets as well as in space. Each faction makes real-time choices on a galactic map using available ground troops, fleets, and other units from the Star Wars universe, including such iconic characters as Obi-Wan Kenobi, Han Solo, Darth Vader, and Boba Fett. The goal is to defeat the opposing side by gradually taking control of as many star systems and strategic points as possible. The more star systems under control of the Empire or Rebellion, the more resources it will have to build defense systems, bases, and units. Yet before players can set foot on one of the over 40 featured planets, including Tatooine, Hoth, and Dagobah, players must first gain orbital control of each planet through space combat. Surviving units can then be deployed to the planet's surface to engage in tactical ground battles influenced by both weather and terrain. An assortment of familiar vessels, troop types, and structures are available to command, from AT-ATs and speeder bikes to X-wings and TIE fighters. Victories and defeats will persist throughout the game, causing players on both sides to rethink their strategies as the galaxy changes. Three play modes include a galactic conquest mode, a story-driven campaign mode, and an online skirmish mode supporting up to eight players. 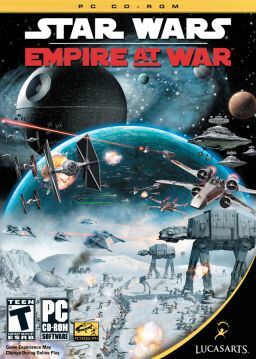 If you need more information please contact the developers of Star Wars: Empire at War (LucasArts Entertainment Company, LLC), or check out their product website.